“I am extremely proud of our investigative team and the countless hours they have invested in this case. We would also like to thank the community for their patience and support throughout this process. Although an arrest has been made, investigators continue to identify evidence in an effort to ensure support of a successful prosecution,” said Colonel David R. Hines, Sheriff. Anyone with further information on this incident is asked to contact the Hanover County Sheriff’s Office at (804) 365-6140 or the Metro Richmond Crime Stoppers at (804) 780-1000. Citizens can also text Crime Stoppers at 274637 (CRIMES), using the keyword “iTip” followed by their tip. Both Crime Stoppers methods are anonymous. 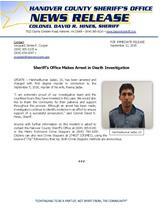 UPDATE – After consultation with the Medical Examiner’s Office, it has been determined that Reena Jadav, 30, died as a result of blunt force trauma. This incident is being investigated as a homicide. Investigators continue to collect and analyze evidence, follow up on all available leads and speak to neighbors. UPDATE – On Monday, September 5, 2016, at approximately 5:43 a.m., the Hanover County Sheriff’s Office responded to the 10000 block of Colony Bee Place for a report of an unresponsive female. Once units arrived on scene they located a female with obvious signs of trauma. Hanover Fire and EMS arrived and pronounced the female deceased. The female decedent has been identified as Reena Jadav, 30, of Mechanicsville. Investigators continue to look into the circumstances surrounding this incident and are working in conjunction with the Medical Examiner’s Office to determine the cause of death. HANOVER, Va. – On Monday, September 5, 2016, at approximately 5:43 a.m., the Hanover County Sheriff’s Office responded to the 10000 block of Colony Bee Place for a report of an unresponsive female. Once units arrived on scene they located a female with obvious signs of trauma. Hanover Fire and EMS arrived and pronounced the female deceased. Investigators are actively looking into the circumstances surrounding this incident and are working in conjunction with the Medical Examiner’s Office to determine the cause of death. The identity of the female is being withheld pending notification to the family.